Home » Articles » How Much Should You Feed a Labrador? Like many other breeds of dog, Labradors were bred to be active, working dogs. The life of a family pet isn’t quite as rigorous as the original tasks the Labrador was bred for, but despite this the breed still maintains its appetite. Many Labradors are well known to scavenge for extra bites to eat and will often overeat if the opportunity arises. With all this in mind, let’s look at what you can do to ensure that you keep the amount your Labrador is eating under control. It’s a common misconception that you only need to manage the amount of food in your dog’s bowl, and it ignores a number of other important factors. When looking at the food you’re giving your Labrador, our advice would be to consider total daily requirement as indicated by the feeding guideline for the food being fed, and divide into 2-3 meals (or more for young puppies). Weigh out the ration for each meal and ensure this isn’t exceeded or supplemented elsewhere – unless you have been instructed to do so by a vet. As each dog’s individual energy requirements may differ from the average used to calculate feeding guidelines, it’s then important you monitor your Labrador’s body condition (and growth for pups) – you can adjust the ration slightly if necessary in response to your dog’s condition. If your dog is eating well, has plenty of energy and is maintaining a slim, fit body condition you can be confident you are feeding the right amount for their specific energy needs. If you aren’t sure how to do this or would like some help in this area, call the helpline for the food you’re using and they should be able to give you tailored advice. Your vet will also be able to help you. It’s important to remember that your Labrador’s requirements will change as it gets older. The feeding guideline that comes with the food should show you how much to feed depending on age – ensure to check this regularly and update ration sizes as your dog ages. As your Labrador gets older, your vet may advise you on specific dietary needs for your dog. Make sure you take these into account when considering how much and what to feed. 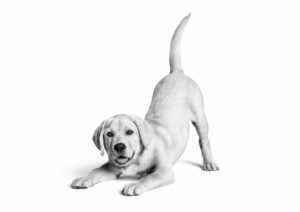 Your Labrador doesn’t just have different needs when it’s older – when it’s a puppy, there are very specific nutritional concerns to take into account. Make sure you choose a complete food specifically for growing dogs. It’s particularly important not to overfeed your puppy while it is growing, or feed it ‘ad lib’. Feeding too much to a puppy can result in a too-rapid rate of growth, which could precipitate joint problems. If you are concerned about how much your Labrador is eating, whether it’s a puppy, an elderly dog or just an active and hungry Lab, then be sure to speak to your vet – they will be able to assess if there is anything to be concerned about and what to do to counteract it.